Condo in Kaanapali, Maui - Much Lower Cost Than Hotels! This condo is in perfect condition all the time with new stainless Sub Zero Refrigerator, Bosch Dishwasher, Jenn Air Stove and New Flat Screen TVs. It is approx. 1200 sq. ft. and over looks the beautiful Golf Course with an ocean view. The pool and BBQ are steps away from the unit but not so close to hear any noise. The master bedroom is private from the rest of the unit and there is a large bath with private vanity area and separate shower area. This is an end unit for extra privacy and views. The Lanai is fantastic at night with views of the lights and sunsets. Nothing nicer than a Maui Sunset. Walk to Whalers Village for shopping, restaurants and the Museum. I am a real estate broker in Thousand Oaks, CA. for 40 years and my husband is a Deputy District Attormey for Ventura County, CA. We have 3 grown children and 6 grand children. We love our careers and will not retire for a while and when we do it will be to Maui. We bought this unit because we used to always rent a friends unit in the same resort for 12 years and loved the resort and location. We love to relax on the lanai and listen to the birds in the moring and then off to various activities, snorkling at Black Rock (walking distance), ziplining which we love and do everytime we come to visit , 3 times a year, I like to do serious 'retail therapy' at Whalers Village and we love eating at the Lahaina Grill and Plantation House. One MUST see Warren & Annabelle's Magic Show, it is first class (reservations required as booked solid all the time). I have never laughed so hard at a show in my life. The Castways Restaurant is walking distance right past the Royal Lahaina and has 2 for 1 pasta dinners on Tuesday nights and the food is good. We always BBQ a lot as it is just below our unit and cleaned each day. There are many fun things to do at the harbor I highly suggest wandering down and taking a look. The activities are never ending. We welcome you to our home. Newly remodeled pools with largest one just going through a 10 million remodel. We love our place in Paradise and we hope you do too. Excellent condo! We loved our stay and will check here first for any return trips. The furnishings are very nice. It is a great location for many activities. We used two of the three pools at the property. There is a an additional $60 registration fee and $17 a night resort fee when you check in, which is important to know ahead of time. Mahalo for providing a great experience! Loved our stay and hope to return! Barbara was responsive and her place was perfect! I am so happy you had such a nice time. Please come back soon Randy. This was our second time at this Condo, we have enjoyed both times that we stayed here. 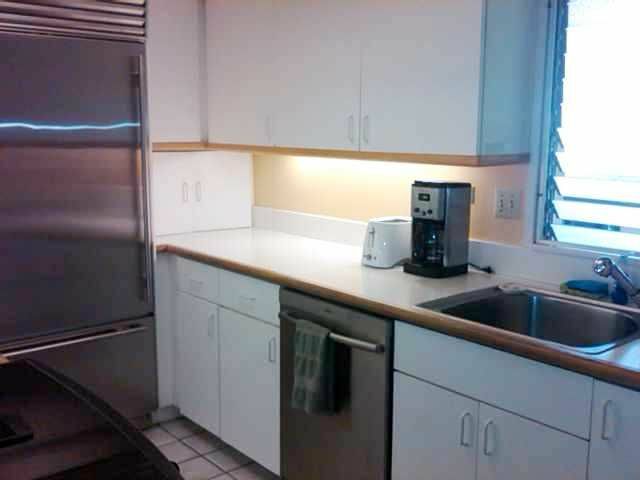 The condo is very roomy and has lots of amenities for the kitchen and beach. There is a very large Lanai that is great for entertaining or just to be able to eat your meals. It is very close to the dolphin pool and barbecues. We loved the beach and cabana that supplies chairs and towels. The condo helped to make our holiday very enjoyable. We would stay there again in the future. Huge lanai, plenary of living space, kitchen has everything you could think of for cooking, packing for the cabana or a day at the pool. Plastic glassware or fancy stemware. Cool A/C and fans, W&D and there were even laundry pods and dryer sheets. Anything you can think of was supplied. We really enjoyed our stay! Everything was amazing here. Looking out on the lanai you can see both the ocean and lanai. Everything is fully upgraded in the unit and you have all the comforts of home all right there. There are a couple grills directly down stairs. Very quiet unit at night which is perfect for us. Barbara has been so on it with communication from the start, getting back to me with all my silly questions. THe only thing that I regret is not booking for a longer period of time.